Give it up for 700 acres of parks and open space in Wylie! Theme Dress – On Friday, 7/12 spread the love for Momma Nature and don your flower power duds. Tag your swag #parkrecluv and #iheartwylierec. 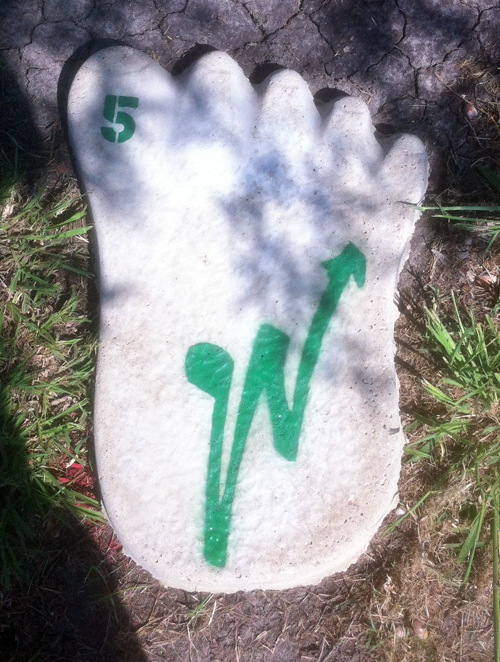 Geo Track Big Foot - Big Foot Tracks Found in Wylie! - Get coordinates and instructions HERE. Post tracks to Instagram and tag #wyliebigfoottracks, open to all ages. Tracking starts Monday, 7/8 and runs through Saturday, 7/13. Rec Mob - We are bringing the Rec to a park near you. Staff-led camp style games and activities for 3 days in 3 parks. Locations posted on Instagram, Facebook and Twitter each morning. Attend all 3 mobs and win a prize! Open to all ages. Get mobbed Tuesday, Wednesday and Thursday, 10 - 11 am. Plant a Plant with Parks - Make friends with the flora! Plant your own take-home flower and learn from Park professionals about gardening at Wylie Recreation Center, open to all ages, Wednesday, 7/10, 10 - 11 am AND Bart PeddicordCommunity Center, open to ages 55 years and up, Wednesday, 7/10, 12:30 – 1:30 pm. Peach Orchard Trip - Founded in 1979, this 100 acre orchard lies just east of Terrell. Ham Orchards consists of 5 orchards containing approximately 6,000 trees. Register per person by 7/10 at the Bart Peddicord Community Center. Open to ages 55 year and up, Thursday, 7/11, 8:30 am – 4:30 pm, $5 per person. Teddy Bear Picnic - “Every bear that ever there was will gather there for certain, because today's the day the teddy bears have their picnic.” We are bringing the popular words to life at this one-of-a-kind event. Bring your bears and a picnic lunch for a story, crafts, a bear movie and lots of fun! Parent participation required. Register per child at Wylie Recreation Center or online. Includes parent. Open to ages 2 - 6 years. Thursday, 7/11, 10:30 am – 12 pm. Hacky Sac Comeback - The ‘90s called. They want their Hacky Sac back! Grab your rasta hat and compete for prizes at Wylie Recreation Center. Open to ages 7 years and older, Friday, 7/12, 11 – 11:30 am. A Recreation Pass is required. Granola Bar - Pick your faves and make your own summer mix. Raisins, craisins, seeds and more at Wylie Recreation Center. Open to all ages, Friday, 7/12 9 – 11 am and again the same day during Lawnchair Theater, 8 – 9 pm. Bart Peddicord Community Center will feature a Granola Bar for ages 55 years and older, 9 am – 12 pm. Drought Tolerant Plants - Learn easy steps for selecting and caring for native Texas and drought tolerant plantings at Bart Peddicord Community Center, open to ages 55 years and up, Friday, 7/12 10:30 – 11:30 am. LIVE! 60s Folk Music in the Courtyard at Wylie Recreation Center, Friday, 7/12, 7 – 8 pm. Food Truck Frenzy - A little taste of Austin – the hottest trend in food right here in Wylie at Wylie Recreation Center during Lawnchair Theater, Friday, 7/12. Lawnchair Theater - Showing ‘The Lorax’ on the lawn! Bring something to sit on and money for food truck concessions at Wylie Recreation Center, open to all ages, Friday, 7/12, 8:30 – 10 pm.